Let me make this clear, it is best not to keep personal stuff on a work computer. But sometimes it is unavoidable and there might be a time when you need to get rid of it all, fast. If so, you need my Doomsday Device, a batch file that will quickly delete all personal information from your computer. WARNING: The Doomsday Device is irreversible. Deleted files and directories cannot be retrieved. Okay, files and directories can be retrieved, but not in the conventional way, unless you have backups, which will also need to be deleted. 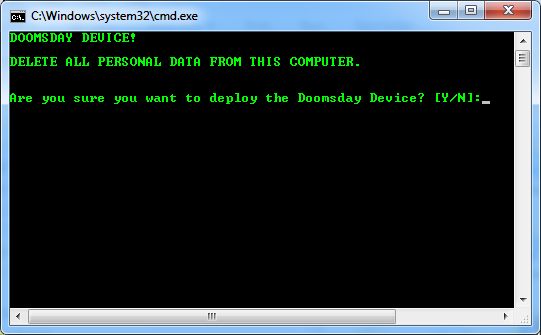 Here's the Doomsday Device code. Copy and paste it into a text file, change the paths, as necessary, and save it in an easily accessible location as Doomsday.bat. See below the code for an explanation of how it works. echo.DELETE ALL PERSONAL DATA FROM THIS COMPUTER. You might have noticed that my blog posts are much shorter than they used to be. I received feedback that, despite the riveting content, people don't have the time or inclination to read long blog posts. We live in an age of fast communication. Not everything has to be 140 characters, but the general rule is to give over the information quickly so the reader can move on to the next thing. Which is why I love shortoftheweek.com. This website provides plenty of free, quality, content. The videos can be as short as only a few minutes. The longest film I've seen on this site is about 20 minutes. SHORT OF THE WEEK HAS BEEN SERVING UP EPIC BITE-SIZED FILMS TO MILLIONS OF FILMMAKERS AND FANS SINCE 2007. WE SEEK TO DISCOVER AND PROMOTE THE GREATEST AND MOST INNOVATIVE STORYTELLERS FROM AROUND THE WORLD. Each film is categorized for easy searching, and is preceded by a sometimes lengthy introduction, which I never read before watching the film. I don't like spoilers. In March 2012 I wrote about my brand new Samsung Galaxy Note. How happy we were together - surfing, texting, Skyping, even making phone calls. Then, in July 2012 I raved about how the Galaxy Note has changed my online life - email, Flipboard, contacts, camera, and books. In May 2013 I went on about how simple it was to upgrade from Gingerbread to Jelly Bean, and how everything works really well. Oh, those halcyon days. Sunny afternoons, just me and my phone prancing through the tall grass, swinging on an old tire from a tree atop a picturesque hill, downloading apps and slicing fruit like a ninja. Are those days gone? Are they merely memories of a bygone era? My phone is now one year and 7 months old (that's about 82 in smart-phone years). It has, I am sad to say, developed a smoking problem. Last Wednesday I plugged in my phone to recharge and smoke puffed out of the connector. There was a burning smell. These machines will learn, adapt and automate decision-making on many levels. Humans will train and program these machines and then hand over their paycheck. Automated and interconnected cars will replace private vehicles, public transport, and taxis. Advances in computerized translations will put translation and localization companies out of business. Online and/or digital books -and the Internet itself - are already rendering the neighborhood library irrelevant. Journalists are being replaced by smart-phone wielding bystanders.Welcome to Technological Unemployment. 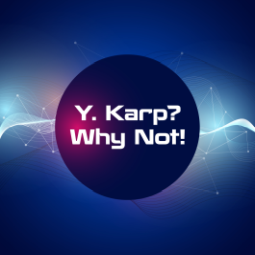 But we've seen this movie before, and we know the answer: adapt. They say that, in business, no employee is irreplaceable. Take a good look at your job. Within the next 15 years you might be handing it over to a machine. I feel it is my manly duty to kill a beast.When in the company of men, there are certain subjects that can be discussed: sports, work, power tools, and hunting.Although I like sports, I don't actively follow a league. I could talk about work, but those conversations usually end up with the other guy complaining about his job. There isn't much to say about my circular saw, so that leaves me with hunting.The best story I have about killing animals is when I murdered a steak on the barbecue. When the meat is indistinguishable from the coals, you know you have a problem. I should go to the forest and kill a lion, a bear, a dear, a rabbit, or maybe catch a butterfly, just so I can have a story to tell the guys. But since my prowess in the jungle is limited to having read the magnificent stories of Tarzan of the Apes, I'll have to satisfy myself with shooting spit-balls at stray tabbies. I could then tell the men about the time I fought that big cat.